Wall Street is panicking, businesses are collapsing, home foreclosures have swept the land. As the government looks at bailing out banks and the nation's behemoth auto industry, one of New England's venerable institutions, the Red Sox, is trying to do its part to ease the pain of a troubled economy. Assembled in the team's ticket office yesterday, grim-faced executives said they had made a policy decision "at the very highest level of the organization," one that could affect millions across the region. They announced they are freezing ticket prices. 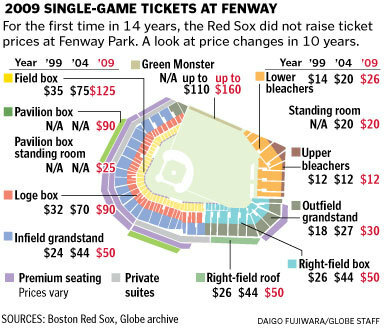 "We have been the beneficiary of fan support and fan loyalty," said Larry Lucchino, the team's president and chief executive, waving a list of ticket prices at Fenway, last year the most expensive in baseball. "And at a time when our fans may be feeling some kind of economic adversity, we should show some sensitivity." The announcement, which ends 14 years of steady increases, was a seismic acknowledgement that the years-long spending spree on professional sports tickets might be slowing, even for a team that has developed a famously loyal fan base. And it was an attempt to reach out to many fans who over the last decade and a half have found a day at the ballpark increasingly out of reach. "We do not want to be the ballpark of the rich and famous," said Sam Kennedy, the team's chief sales and marketing officer. Teams across the country are finding that the gilded years of raging demand for live sports that fueled lavish stadiums, expensive stars, and corporate luxury boxes seem to be sputtering. 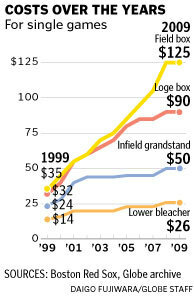 In recent days, the Houston Astros froze ticket prices at 2008 levels. The Pittsburgh Pirates and Colorado Rockies froze season ticket prices. The New York Yankees, who are preparing to enter a new $1.3 billion ballpark, have not been able to sell seven luxury suites that cost $600,000 a season. The National Basketball Association, worried about the economy, said it was laying off 9 percent of its workforce, and forecast a decline in season ticket sales. In a highly unusual gambit, one NBA team, the New Jersey Nets, announced it was giving away free tickets to the unemployed. The National Football League said the average playoff ticket price will drop about 10 percent from last season. "You'll see a lot of different strategies being followed by teams, and all of them are in recognition and anticipation of the fact that we're in the beginning of a very steep and probably pretty long recession, the likes of which none of us have seen in our lifetime, unless we're 90 years old," said Andrew Zimbalist, an economist at Smith College, who studies professional sports. The freeze was put in place after the Red Sox shed $28 million in payroll costs with the departure of Manny Ramirez and Curt Schilling. The home dates will remain among the most expensive tickets in baseball, with an average price of $48.80, according to Team Marking Report, and Fenway is still selling out. The park has been packed for 469 consecutive games, every one since May 15, 2003. The waiting list for season tickets has 7,000 names. But the team is clearly worried that the crumpling economy could force many fans to cross the Red Sox off their budgets. "I wouldn't be surprised to see some falloff, just given the economic realities," Kennedy said. "If you lose your job or if your company goes out business, I don't think we're immune to that." Kennedy said the team enlisted a Harvard professor of business and government, Robert N. Stavins, to analyze the market value of Sox tickets. He concluded that they could be sold for "much greater than face value." Kennedy said the team believes it could still sell the seats, "so we recognize we are leaving money on the table" by freezing prices. But it came down to a matter of fairness, he said. "It's easy to just sit around and look at spreadsheets and plug in numbers and say, 'Hey, if we charged $25 for that upper bleacher instead of $12, we could generate X amount more in revenue,"' Kennedy said. "But we clearly don't do that, because we are thinking like a fan." Fans, however, said it will take a lot more than a freeze in ticket prices to make a day at the ballpark affordable, especially when many are worried about losing jobs and making ends meet. "We work here full time, and we can't afford tickets to bring our families here," said Frank Yanovich, 38, a union bricklayer who was repairing the bricks on the Fenway facade yesterday. "It's still expensive . . . for a family of four. I mean, that's a car payment, a monthly car payment, to go to a game." Still, by stopping the upward march of prices, the Red Sox did seem to reach some fans who have watched with a kind of awe as a once accessible pastime became the exclusive provenance of the rich and well connected. "You don't want them to keep going up and up," said Mike Bruno, 41, a communications technician from Lakeville. "It's hard enough to get a decent seat. Try taking your kids, and it's like a million dollars. Then you've got to park and everything else." Perhaps most important to the Red Sox is keeping intact the mystique and loyalty that has defined the team and kept fans coming, year after year. "It's very important for a team like the Red Sox, that has six years of sellouts, to maintain the buzz, the excitement, the cachet around the team," Zimbalist said. "The Red Sox don't want to be in a situation where the price is above the market and they have empty seats," he said, which would take "the shine off the entertainment."